I was really sad to read about Dr. Victor Stenger’s passing. He had some very lively debates with William Lane Craig but I remember him most for his writings from the 1990’s and that is when I first starting writing letters to him. Following a career as a research scientist in the field of particle physics, Stenger was associated with New Atheism and he also authored popular science books. He published twelve books for general audiences on physics, quantum mechanics, cosmology, philosophy, religion, atheism, and pseudoscience, including the 2007 best-seller God: The Failed Hypothesis: How Science Shows That God Does Not Exist. His final book was God and the Multiverse: Humanity’s Expanding View of the Cosmos (September 9, 2014). He was also a regular featured science columnist for the Huffington Post. He was a strong advocate for removing the influence of religion from scientific research, commercial activity, and the political decision process, and he coined the popular phrase “Science flies you to the moon. Religion flies you into buildings”. 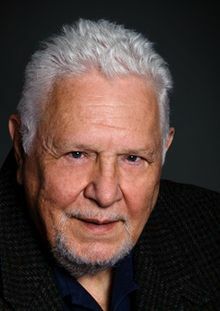 Victor J. Stenger was born on January 29, 1935 and raised in a working-class neighborhood of Bayonne, New Jersey. His father was a Lithuanian immigrant and his mother was the daughter of Hungarianimmigrants. He died in August 2014 at the age of 79. Victor Stenger (1935-2014) – Arguing God from Natural Theology? In the second video below in the 89th clip in this series are his words and my response is below them. Teams of scientists from three highly respected institutions — the Mayo Clinic and Harvard and Duke Universities — have performed carefully controlled experiments on the medical efficacy of blind, intercessory prayer and published their results in peer-reviewed journals. These experiments found no evidence that such prayers provide any health benefit. But, they could have. Obviously they were hoping to demonstrate that God existed by showing that prayer worked, but it could have and the point is it could have. The people who say that science has nothing to say about God are just wrong. The theist God (Stenger defines this God as a God that acts in the world in contrast to the deist God that does not) should have been detected by now and that is the statement I tried to make and the proper position science should take, but we are ready to hear the evidence to the contrary. I reject evolution not only for logical reasons, and not only for moral reasons, but I reject evolution for theological reasons. Now, this may not apply to others, but friend, it applies to me, because the Bible doesn’t teach it, and I believe the Bible. And, you cannot have it both ways. There are some people who say, “Well, I believe the Bible, and I believe in evolution.” Well, you can try that if you want, but you have pudding between your ears. You can’t have it both ways. Second, I wanted to point out some scientific evidence that caused Antony Flew to switch from an atheist (as you are now) to a theist. Twenty years I had the opportunity to correspond with two individuals that were regarded as two of the most famous atheists of the 20th Century, Antony Flew and Carl Sagan. (I have enclosed some of those letters between us.) I had read the books and seen the films of the Christian philosopher Francis Schaeffer and he had discussed the works of both of these men. I sent both of these gentlemen philosophical arguments from Schaeffer in these letters and in the first letter I sent a cassette tape of my pastor’s sermon IS THE BIBLE TRUE? (CD is enclosed also.) You may have noticed in the news a few years ago that Antony Flew actually became a theist in 2004 and remained one until his death in 2010. Carl Sagan remained a skeptic until his dying day in 1996. Two things should be mentioned about the time of Moses in Old Testament history. First, consider the archaeological evidence that relates to the period. True, it is not of the same explicitness that we have found, say, in relation to the existence of Ahab or Jehu or Jehoiakim. We have no inscription from Egypt which refers to Moses being taken out of the bulrushes and removed from the waterproof basket his mother had made him. But this does not mean that the Book of Exodus is a fictitious account, as some critics has suggested. Some say it is simply an idealized reading-back into history by the Jews under the later monarchy. There is not a reason why these “books of Moses,” as they are called, should not be treated as history, just as we have been forced to treat the Books of Kings and Chronicles dating 500 years later. We know from contemporary discoveries that Semites were found at all levels of Egypt’s cosmopolitan society. (Brooklyn Museum, New York, no. 35, 1446. Papyrus Brooklyn). There is nothing strange therefore about Joseph’s becoming so important in the pharaoh’s court. The store cities of Pithom and Raamses (Rameses) mentioned in Exodus 1:11 are well known in Egyptian inscriptions. Raamses was actually in the east-Delta capital, Pi-Ramses (near Goshen), where the Israelites would have had ample experience of agriculture. Thus, the references to agriculture found in the law of Moses would not have been strange to the Israelites even though they were in the desert at the time the law was given. Certainly there is no reason to say, as some critics do, that these sections on agriculture were an indication of a reading-back from a latter period when the Jews were settled in Canaan. The form of the covenant made at Sinai has remarkable parallels with the covenant forms of other people at that time. (On covenants and parties to a treaty, the Louvre; and Treaty Tablet from Boghaz Koi (i.e., Hittite) in Turkey, Museum of Archaeology in Istanbul.) The covenant form at Sinai resembles just as the forms of letter writings of the first century after Christ (the types of introductions and greetings) are reflected in the letters of the apostles in the New Testament, it is not surprising to find the covenant form of the second millennium before Christ reflected in what occurred at Mount Sinai. God has always spoken to people within the culture of their time, which does not mean that God’s communication is limited by that culture. It is God’s communication but within the forms appropriate to the time. The Pentateuch tells us that Moses led the Israelites up the east side of the Dead Sea after their long stay in the desert. There they encountered the hostile kingdom of Moab. We have firsthand evidence for the existence of this kingdom of Moab–contrary to what has been said by critical scholars who have denied the existence of Moab at this time. It can be found in a war scene from a temple at Luxor (Al Uqsor). This commemorates a victory by Ramses II over the Moabite nation at Batora (Luxor Temple, Egypt). Also the definite presence of the Israelites in west Palestine (Canaan) no later than the end of the thirteenth century B.C. is attested by a victory stela of Pharaoh Merenptah (son and successor of Ramses II) to commemorate his victory over Libya (Israel Stela, Cairo Museum, no. 34025). In it he mentions his previous success in Canaan against Aschalon, Gize, Yenom, and Israel; hence there can be no doubt the nation of Israel was in existence at the latest by this time of approximately 1220 B.C. This is not to say it could not have been earlier, but it cannot be later than this date. The Moabite Stone was discovered by by Klein 1868 BC at the ancient city of Dibon. Only a fraction was found and put back together. It is presently housed in the Louvre in Paris, France. Mesha King of Moab, wrote the Moabite stone in about 900 BC. The Stele is the oldest known evidence of the Tetragrammaton YHWH (Yahweh) as the personal name God revealed to Moses. It also references the tribe of Gad. It also references two known kings from the Bible: Omri the king of Israel and Mesha King of Moab. It also harmonizes with the Bible in that the King of Moab paid tribute to Omri. There are also references to building many cisterns for water which is possibly a reference to the miracle of water God used to defeat the Moabites. The Merneptah Stele has long been touted as the earliest extrabiblical reference to Israel. * The ancient Egyptian inscription dates to about 1205 B.C.E. and recounts the military conquests of the pharaoh Merneptah. Near the bottom of the hieroglyphic inscription, a people called “Israel” is said to have been wiped out by the conquering pharaoh. This has been used by some experts as evidence of the ethnogenesis of Israel around that time. But a new publication by Egyptologists and Biblical scholars Manfred Görg, Peter van der Veen and Christoffer Theis suggests that there may be an even earlier reference to Israel in the Egyptian record. Manfred Görg discovered a broken statue pedestal containing hieroglyphic name-rings in the Egyptian Museum of Berlin and, after studying it with colleagues Peter van der Veen and Christoffer Theis, they suggest that one of the name-rings should be read as “Israel.” Not all scholars agree with their reading because of slight differences in spelling, but Görg, van der Veen and Theis offer strong arguments, including supportive parallels in the Merneptah Stele itself. This newly rediscovered inscription is dated to around 1400 B.C.E.—about 200 years earlier than the Merneptah Stele. If Görg, van der Veen and Theis are right, their discovery will shed important light on the beginnings of ancient Israel. * See Frank J. Yurco, “3,200-Year-Old Pictures of Israelites Found in Egypt,” Biblical Archaeology Review, September/October 1990. For more about the discovery of a possible first mention of Israel before the Merneptah Stele by scholars Manfred Görg, Peter van der Veen and Christoffer Theis, see “When Did Ancient Israel Begin?” in Biblical Archaeology Review, January/February 2012.